Rotunda for the Charters of Freedom — The National Archives, Washington, D.C.
“Hey, look at that,” I said to myself, which was unnecessary since I was already looking at it. We were in the rotunda of the National Archives in Washington, D.C., examining the Declaration of Independence, the Constitution and the Bill of Rights. You undoubtedly remember from your high school Civics class that the Bill of Rights was a collection of ten amendments to the Constitution. As I stood there squinting at the original document, though, I noticed that there were twelve articles, not ten. What we call the First Amendment was actually number three in the original lineup. The first two didn’t make the cut — at least, they didn’t back when somebody’s quill pen enumerated the articles on this piece of parchment. It was 1978 when I learned this, and all I did about it was say “hunh”, and then I moved on to look at other exhibits in the National Archives. A few years later, in 1982, a sophomore at the University of Texas named Gregory Watson needed a topic for a paper in his government class. While doing some research, he stumbled upon the two proposed Constitutional amendments that had gone unratifed since they were originally proposed by James Madison in September, 1789. Unlike me, Watson did something with that information. The 20-year-old student focused on the second proposed amendment, which had to do with pay increases for members of Congress. It read, “No law, varying the compensation for the services of the Senators and Representatives, shall take effect, until an election of Representatives shall have intervened.” In other words, any pay raise that Congress approved would not take effect during the current session, so they couldn’t directly give themselves a bump up. Or technically, a pay cut — yeah, like that would happen. A few states had ratified the proposed amendment back in the 1790s, but not enough for passage, so it had basically been in a coma for almost two centuries. Realizing that there was no time limit built in, meaning that passage was still theoretically possible, Greg Watson did more research and became convinced that it was a good idea and needed to be ratified by the state legislatures and passed into law. That’s the paper he wrote for his government class; his instructor was unimpressed — she gave him a “C”. Undeterred, Watson started a one-man letter writing campaign to state legislatures. Remember, this was before the internet, so he was typing letters and paying postage out of his own pocket to mail them. Stricter controls on Congressional pay raises proved to be a popular idea, which probably doesn’t surprise you. Maine ratified the amendment in 1983; Colorado did in 1984. Five more states ratified it the following year. High-profile figures ranging from Howard Jarvis to Ralph Nader started pitching in with favorable comments, but Greg Watson remained the driving force behind the campaign. It took ten years — Watson had long since finished college — but eventually the necessary three-quarters of the 50 states (38) had ratified it, and that second article officially became the Twenty-seventh Amendment to the U.S. Constitution on May 7, 1992 — almost 203 years after James Madison had proposed it. By the way, the first article on that original document is still not ratified, and we can hope it stays asleep. It’s about Congressional apportionment, spelling out a formula by which the number of Representatives would increase as the population increased. If this proposed amendment had been ratified, we would now have way over 5,000 members in the House of Representatives. The current 435 members seems like plenty to me. This entry was posted in History and tagged Gregory Watson, James Madison, Twenty-seventh Amendment. Bookmark the permalink. 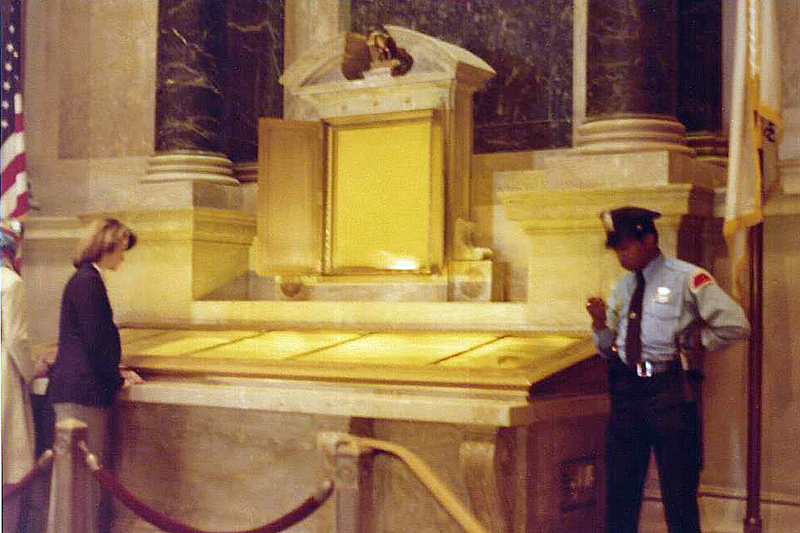 The guard wasn’t checking his cell phone back in 1978. I’m guessing that hang nail was giving him a real problem. I hope Watson’s teacher reads this post and feels chagrined. So, Jen, I guess she isn’t feeling particularly chagrined, but at least she isn’t bragging to her colleagues about her star pupil, either.